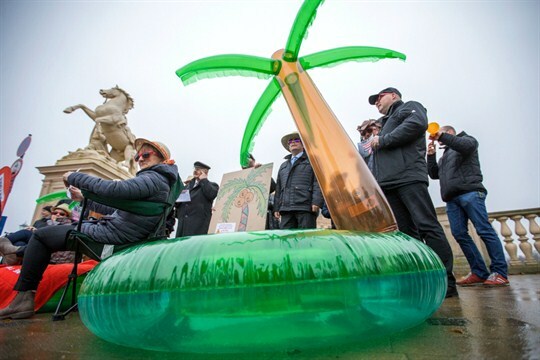 German state representative Jeannine Rosler, left, participates in a protest against tax evasion prompted by revelations included in the Paradise Papers leak, Schwerin, Germany, Nov. 15, 2017 (dpa photo via AP). Public interest in offshore banks and their financial services, particularly in the Caribbean, has risen considerably after revelations in two major leaks known as the Panama Papers and the Paradise Papers. The increasingly common practice of the super-rich, celebrities and political figures using Caribbean countries to shelter their income from taxes at home has been a gold mine for investigative reporters. The public outcries have pushed politicians to respond, most recently and prominently with the European Union’s decision to blacklist 17 tax havens “seen as not cooperative on tax matters,” including several in the Caribbean.